Pilgrims on the Kathy Trail, MO. 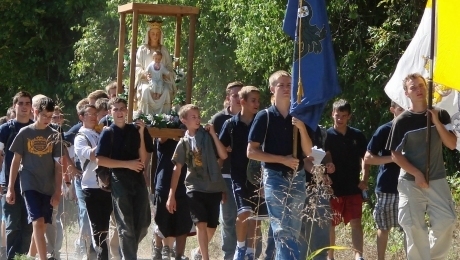 Come join us with your family in this 3-day, 40-mile pilgrimage in honor of Our Lady! A great opportunity to celebrate Our Lady on October 13 for the anniversary of Fatima! the 3-day pilgrimage will start at the Katy Trail trailhead in Jefferson City, MO, proceeding through Tebbetts, Mokane, Portland, and Bluffton to conclude near the Shrine of Our Lady of Sorrows in Starkenburg, MO.